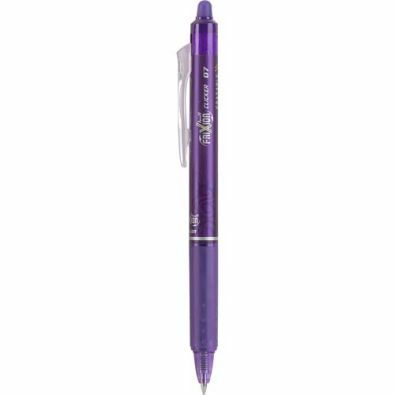 Combines the convenience of a retractable with the incredible FriXion erasable gel ink. Erase and rewrite repeatedly without damaging documents! No wear or tear! Eraser is at the top of the pen, tip is retractable by pressing clip down. Unique Thermo-Sensitive Gel Ink formula disappears with erasing friction. Refillable. Fine Point (0.7mm). - Note: Erasable pens are not recommended for use on legal or office documents. Do not expose to extreme temperatures (<14 degrees Farenheit;>140 degrees Farenheit) If pen is exposed to temperature that reaches 140 degrees Farenheit, the ink will be colorless when writing. To restore color, cool to at least 14 degrees Farenheit in freezer and the ink will again write in color.